How Many Do You Know That Would Recognize A One Of Them? A reason I can’t get as good sense of modern films is people in them being strangers to me. At what point do we stop following players, quit knowing them, stop being engaged by them? I met that crossroad some time back, am so far behind now as to never catch up. A friend handed me a Smart Phone with a digital image of himself with an actress named Jennifer Lawrence. I recognized her no more than moderns would Theda Bara. Worse was nonplus at Jennifer Lawrence being the highest paid actress of 2015 and 2016 (says IMDB). Going to current movies might help, but there's oblige to see Hunger Games or X-Men: Apocalypse, what’s left of life way too short for that. Why be incredulous, then, at viewers drawing blank to starry 1954 cast of Woman’s World? Buffs lifelong in the bag can’t conceive saying who’s that to Lauren Bacall, June Allyson, Clifton Webb … in fact, the whole ensemble. I mentioned Cornel Wilde to a woman once, and she said, “Oh yes, he was in an I Love Lucy,” me grateful for small crumb that was. Here’s a reason why civilians don’t cotton to classics: They have no, and I mean no, frame of reference. 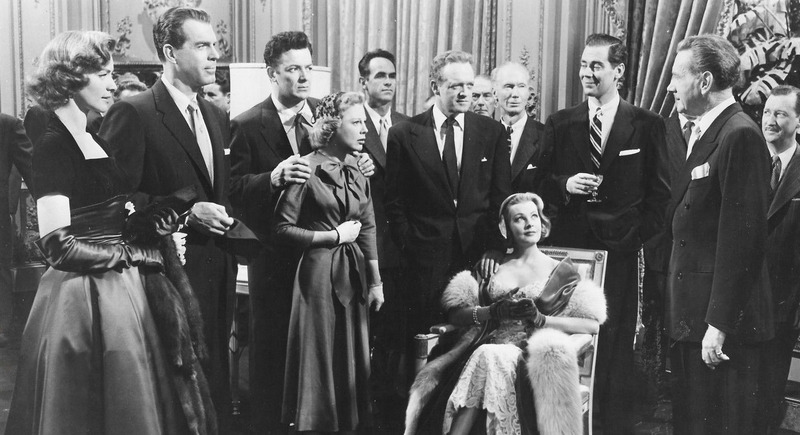 You might say yes, but Fred MacMurray was on My Three Sons, and Lauren Bacall was married to Humphrey Bogart. Well, first off, who’s Humphrey Bogart? --- and secondly, do we forget that My Three Sons went off network forty-seven years ago? By way of experiment with a lab rat of lifetime acquaintance, I ran Woman’s World to confirm bleak theory, which held, but here was salve: it still pleases, even to a least indoctrinated to Hollywood of old. We need context, at least some recognizable element, to enjoy any film. What fun comes of being a stranger to a strange film? Bad enough watching old faces comport in older clothes, drive odd cars, use dial phones. They smoke a lot too, sometimes even cigars. For retro dwellers, that’s a comfort zone. We adjust to 1954 as easily as being cold outside in the winter. Not so friends who make error of letting us pick a movie to watch. For them, 1954 or any past year makes awkward fit. How often do even devotees “cringe” at what many call unenlightened times? Vintage films become more a briar patch every day. When does old simply become too old? We who care need to empathize better with those who don’t, and keep in mind that they are doing us a favor to watch Woman’s World or any relic we might impose in the name of “sharing.” Hopeful voices say Stan and Ollie will “bring back” Laurel and Hardy. The hell it will. 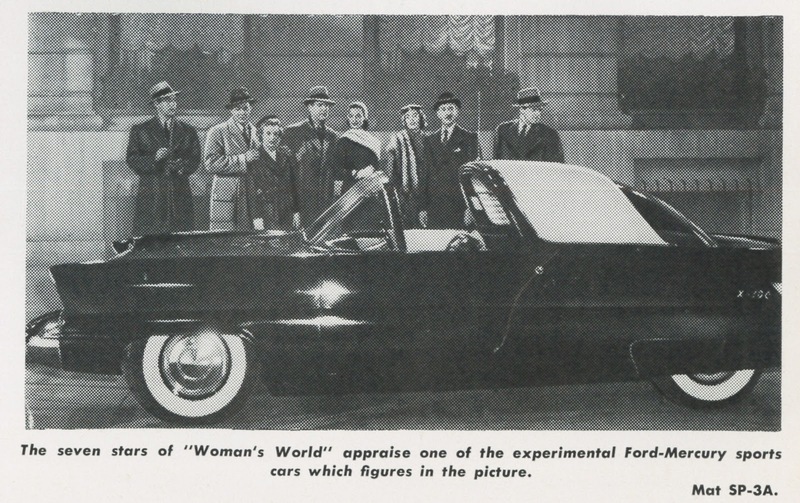 The world that received Woman’s World in 1954 is too gone to retrieve even in part. So too are all the people. 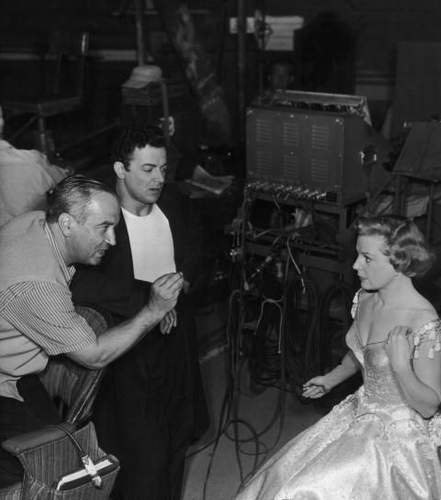 Of principals, only Arlene Dahl is left. Never discount a mass of humanity who won’t watch oldies because everyone in them is dead. Billy Wilder once said he didn’t like repeat view of his past stuff for that very reason. So how to spring Woman’s World upon those willing to take a chance? I could propose a way, convoluted and wholly impractical, but it might work, given days if not a month of your friend’s focus, but who has that to give a pastime wholly unimportant to those outside the movie life? They could bone up instead on entrance exams to medical school and maybe get in. Here’s the plan, utterly impractical as it is, but close as you’d get to making Woman’s World a meaningful sit. 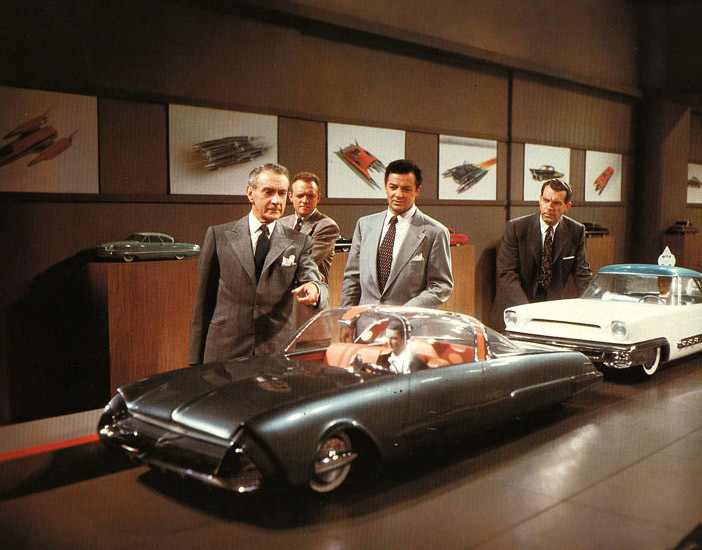 First show them what car design was like in 1954. There are product and promo reels on You Tube to help. They are time capsules of vanished style and technology. 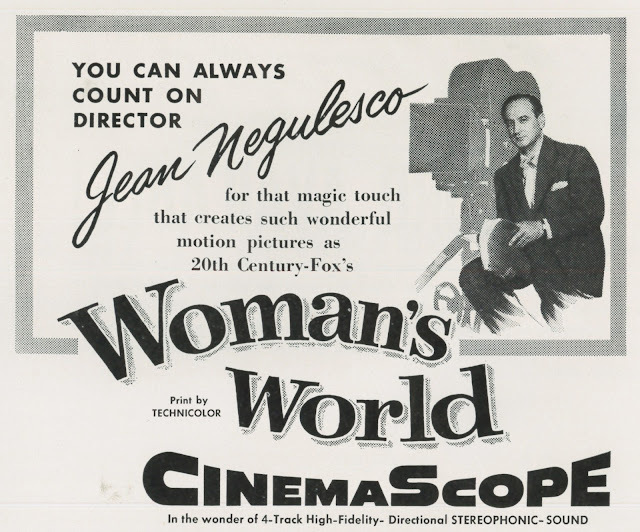 Did I forget to mention that Woman’s World takes place at a Gotham nerve center of auto manufacture with Clifton Webb as the tycoon owner seeking a second in command, to be picked from three couples auditioning? 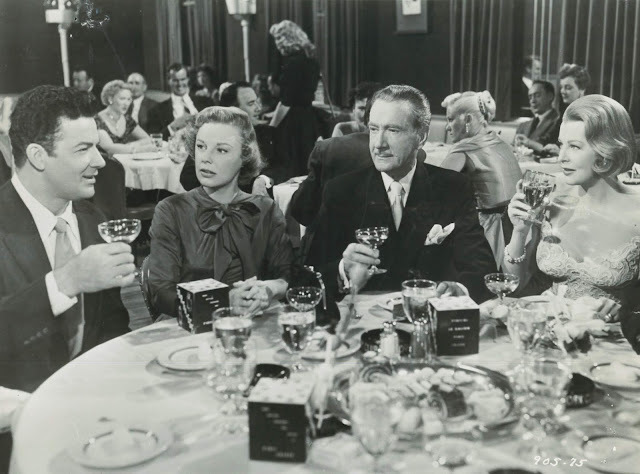 They are Fred MacMurray/Lauren Bacall, Cornel Wilde/June Allyson, and finally Van Heflin and Arlene Dahl. A knowing Webb looks as close at wives as their applicant mates. 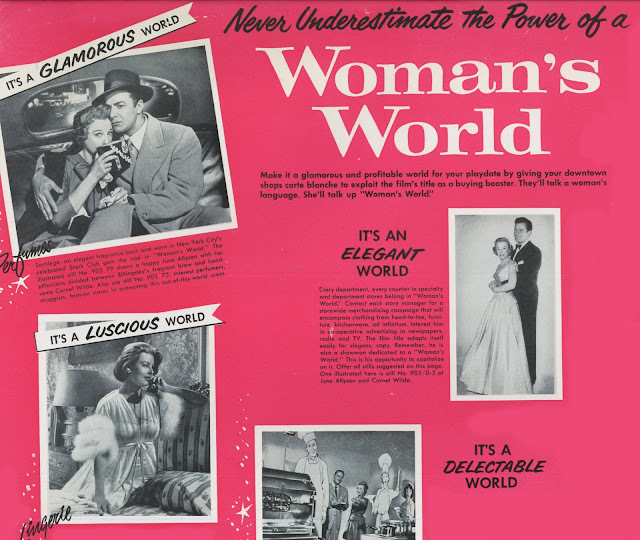 He realizes that it is indeed a woman’s world in terms of influence they wield over husbands, but Woman’s World does not imprint this with a heavy hand, being comedy at its root and dedicated more to fashion of the moment, as in 1954, and how best to amuse a casual consumer of films during that year. I should mention the obvious … that Woman’s World is a delightful show and as good a capture of high life in the year I was born than any more celebrated title that comes to mind. Why else would I compose such an exhausting primer on how to present it? Back to my scheme then: Don’t give them Woman’s World cold. Start with introductory work its cast did before and after. For Clifton Webb, run Laura, maybe Dreamboat, certainly Titanic. Your individual or group will then love and anticipate him going into Woman’s World. 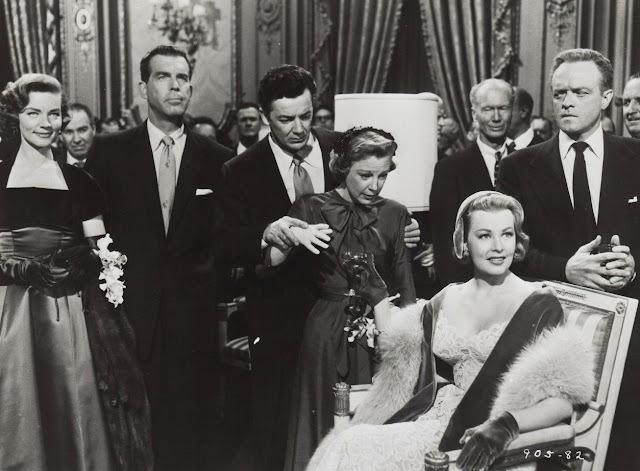 June Allyson in Executive Suite, The Glenn Miller Story, The Girl in White (a favorite, if obscure). Tell how Executive Suite came out but months ahead of Woman’s World, latter a froth doppelganger. Similar comparison can be made with Van Heflin and way-darker Patterns. Cornel Wilde will be the challenge. Introduce him as the Great Sebastian, or Chopin, or one of the Columbia sword shows? The Naked Prey would not be amiss to show range. Anyway, you get the idea as it could apply to whole of Woman's World cast. Trouble is sheer heft of such a project, and all to make familiar ground of one movie. Sometimes too, even past familiarity can backfire. I once ran a hard-got 16mm print of Since You Went Away to my sister, who said on seeing Joseph Cotton, “Oh no, there’s that Uncle Charlie” (we had, the week before, watched Shadow of a Doubt). Impressions from past work feeds into each thing we see actors do. That was never so true as during the Classic Era (or should I just call it the Studio Era, as they certainly weren’t all classics). We embrace an ongoing star persona as much, or more, than whatever individual part they take. At least it was that way when fame was built on contract and merchandising foundations. For we who hang on by life raft that is TCM, the process yet thrives. Start-to-finish knowing of star lives and careers enrich Woman’s World and all the rest of an increasingly remote past. An enchanted place to be, even as it widens gulf between us and those we’d induct to embrace of old film, if only we could. Woman’s World is available on Blu-Ray. Get it by all means, and wallow. Great article John! I do find it interesting that I run into people who will not watch a black and white film or movies with lots of dead people in it. When I first started showing, ala projector, my Laurel and Hardy films to people in the early '70's, the most heard comment was: "Laurel & Hardy? They're dead!" It seemed then there was an unwritten rule that watching dead people perform was strange. Another reason classic film is being buried in our present culture is that there are so many entertainment choices not available 40 years ago. 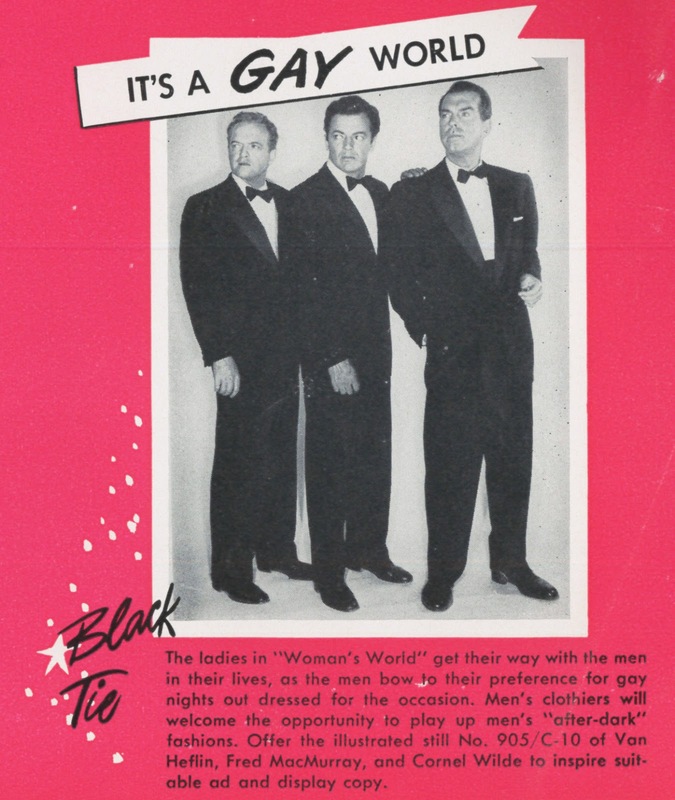 Even I might have trouble telling Van Heflin from Cornel Wilde! They always seemed a matched pair to me. I saw the cover image for this year's Oscar issue of Vanity Fair, I recognized 4 out of 11 young stars in it. I guess that's official old fogeydom. There are certainly younger performers I think are highly capable-- both Oscar Isaac and Adam Driver, when they're not fighting Star Wars, seem strong and charismatic and deserve to live in an era that would make better use of their abilities like the early 70s; on the female side, Amy Adams gets better and better, again, when she's not playing Lois Lane-- but seeing most young stars makes me feel like an Oliver Sacks patient who has lost the ability to distinguish between faces. So many scrubbed, good-looking, utterly generic young people! Wait till they get some crinkles, if they can avoid going to the plastic surgeon to iron them away. But I suppose my grandfather probably felt the same way when asked to evaluate Edd "Kookie" Byrnes vs. Gardner McKay. I, too, relate better to movies and actors of the past, particularly pre-1950, than anyone today. It's an odd feeling -- what am I doing here when I should be back there? I have grown to appreciate and enjoy more the black and white movies of the forties to the widescreen and color movies of the fifties. I have been finding that those CinemaScope shows in contemporary settings feel today far more obsolete and unappealing than the contemporary shows of the previous decade. I frankly have a complete dislike of cars from the 50s with the marginal exception of the Ford Falcon which, in Argentina, it still commands devotion despite failed attempts to put some negative lights to it. And the music of those years is mostly disappointing. Most of my favorite artist of that time were actually people from previous decades that were still active and in full command of their craft while others began a notorious declination in quality. A thought: Match films to modern-made shows and movies about that era. Modern-made items often takes into account audience unfamiliarity and, at their best, build in the necessary exposition. 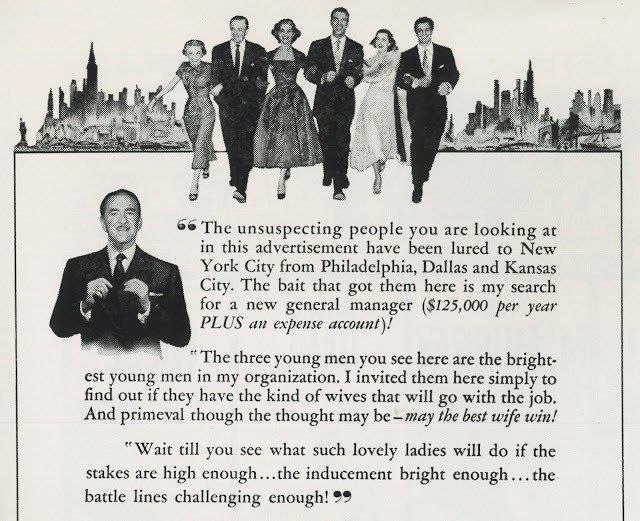 "Mad Men" would give context to a lot of 50s-60s films set in that world. That runs the gamut from Hollywood fantasies of big business like this one to more realistic, sidewalk-level fare. "Downton Abbey", soapy as it is, could likewise enhance films made or set in upper-crust Britain from WWI on. "Matinee" works as a gateway to 50s-60s horror and scifi, illustrating what those films were to their audiences. "Mr. Bean" teaches viewers to look for the joke rather than listen for it. A possible gateway to silent comedy, unless Bean himself is already too ancient. The excellent British mystery series "Foyle's War" covered home-front crime and dug deep into real history. That would lend interesting context to stiff-upper-lip epics such as "Mrs. Miniver". If you want to see Mr. Wilde in true form catch a viewing of The Naked Runner - Great movie! Stinky's plan is much more practical and much less empathetic: make no attempt to show an old movie to someone who has no interest. It is doomed to failure. When Stinky was a li'l nipper, he cared not if the actors were alive or croaked, or what year the film was made. Is this cultural or personal? Are more people uninterested in older movies today? Who knows? But it is distressing to contemplate. One this is for certain: Cornel Wilde is a tough sell. He makes me long for Victor Mature, and that is saying something. Stinky wishes someone introduced Arlene Dahl to him years ago. She is hot stuff. Donald Benson- Foyle's War is one of the best things ever. But if a person does not care about old movies, it is not likely he will care about history. And after unsuccessfully attempting to show it to an unreceptive friend, you will be left weeping into your pint of bitter. Steve: It's THE NAKED PREY. I'm 62, and I still find myself referencing the '70s as a measuring point of what movie going was to me during an impressionable time. But even a Dustin Hoffman or Robert Redford are now 80 and up, for durn sake! Burt Reynolds is dead. Jane Fonda hangs on. Clint Eastwood amazes, but for how much longer? Former young pups Tom Hanks and Meryl Streep are now, at last to me, the prevailing status quo--but who am I kidding--they're in their 60s! I know who Jennifer Lawrence is, but I just haven't been interested in her movies. I have to catch myself when I express interest in Stan & Ollie and The Green Book--new movies, but period pieces. Gotcha! I don't want to feel alienated from current pop culture, but it's way more an effort to feel as attuned as I was. I'm now an old coot--that must have heppened during the night! First off, an absolutely terrific post coming, I might add, after quite a string of winners. You've really been on the top of your game lately, John! And, yes, just the phrase "an actress named Jennifer Lawrence" brings a smile to my wrinkled mug. It almost sounds like someone is calling attention to an unknown exotic species that has somehow snuck into the ecosystem. In fairness to the woman, besides raking in bazillions of dollars making sci-fi blockbusters many of us will never watch, she did nab four Oscar nominations including one Best Actress win all before her 25th birthday. Still, my amused reaction reading this was "Boy, am I on the right blog!" Actually just watched WOMAN'S WORLD with my wife, not on Blu-Ray but Youtube (don't judge me!) A lot of fun! We both loved it, even though Jean didn't remember ever seeing it with me 35 years ago. I think much of your observations are spot on but I might differ on some details. I have many friends, even some way out of my age demographic, who would have a hard time identifying half, or even any of the actors but would still watch and enjoy this sort of thing. Not recognizing Hollywood elite from three generations ago doesn't mean one lacks the frame of reference you mention. I'm off to our local independent theater tonight to see four restored Laurel & Hardy shorts on the big screen, booked no doubt to exploit the current run of STAN & OLLIE. Will these old movies ever regain their status as the coin of the realm they were when we were young? Of course not. Will our grand kids kvetch that nobody now days recognizes any of the characters from THE SIMPSONS? You bet! Time does march forward. I agree with you, John, that STAN AND OLLIE will not "bring back" Laurel and Hardy... not to the household words they were in the 1950s and '60s, anyway. But I am pleased to report at least one ray of sunshine. I am an officer in the international Laurel & Hardy society Sons of the Desert, and since STAN AND OLLIE has started playing in theaters, I've heard from 17 people who want to start their own local chapters. That's an average of every other day. So the movie is indeed turning people on to Laurel & Hardy, or reminding them of how much fun Laurel & Hardy can be. John and Scott MacGillivray - Quick follow up to my comment yesterday. I did go to that one night only show of four restored Laurel & Hardy shorts (including BATTLE OF THE CENTURY) at our local theater last night. House was almost packed. Saw a few of my Sons of the Desert cronies, but mostly unfamiliar faces and of a surprisingly wide demographic range. No kids, but two twenty something women sat directly in front of us and howled through the whole show. I may have missed the info, but what were the four L & H shorts? Barry Rivadue - BERTH MARKS, BATTLE OF THE CENTURY, BRATS and BUSY BODIES. BRATS looked great but like every print I've ever seen of this title , still has a soft diffused focus. The second half of THE BATTLE is, of course, blown up from 16mm, but was looking pretty good. Major revelation was BERTH MARKS... amazingly sharp picture and SOUND! A surprisingly poignant post. Let me make a couple of observations. Yeah, Woman’s World is terrific. And, seriously, isn’t Clifton Webb an asset to any movie. He is so good in this. It’s one of his best performances. But I think you are more than nostalgic for a lost type of movie … I think you’re nostalgic for a lost America. As I said, I grew up during the Nostalgia Craze; even as a youth, I realized we were in the midst of enormous social change. (I’ll leave it for the reader to decide whether it was for the better.) But by the time this social change was over, those who grew up in the world of Woman’s World were suddenly adrift. There ‘people’ gone, their way of life, their way of looking at the world. Again, this isn’t just the differences of time. The Thirties were radically different from the Mad Men era, but they were recognizably the same world. After the social changes of the late Sixties/early Seventies, not so much. I mourn that time and that people. There are some of us left (and some of us were the rear guard, like me); and all of us are wondering, what the hell happened….? “Woman’s World” is cycled on FXM Retro, so I’ve had the opportunity to watch it from time to time, savoring the whole of it or just a taste. I enjoy it, but then, I’m not at all removed from the sensibility it reflects. I wonder, though, what another, younger audience would make of it? The story is of men in line for an important position and the women in their lives. One man will be chosen, but as important as his own qualifications are, the woman he’s married to is equally important. Thus, what is ostensibly a man’s world, in which he will take the position and receive credit for the success, is also a woman’s world, in which his success depends upon her inspiration and support. I haven’t looked at the last edition of Maltin’s movie guide, but I suspect that, if there were ever to be future editions, “Woman’s World” would be described as a “dated comedy of manners.” A comedy of manners it may be—when you suggested that, John, though it hadn’t occurred to me before, I could only think, “of course,” in response—but with regards the mores of today, I cannot think of anything more out of touch. 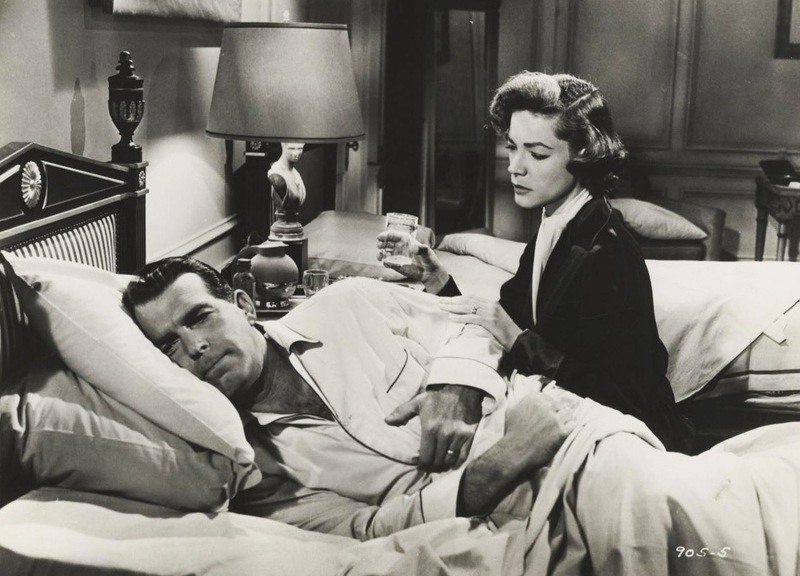 As depicted in the film, marriage is in the nature of a joint venture, in which husband and wife play complementary roles. In what venue, apart from the more conservative religious denominations, would such a concept be recognized, let alone celebrated? When commitment is thought of now as being essentially to one’s self—that is, to one’s nature or desires, even to one’s whims--what place would a relationship have that was based upon the mutual difference of a man and woman to each other? “Woman’s World” appeals to me because, for all its archness and satirical touches, it suggests what are to me eternal verities, with all their variations and permutations over the years, but the same. There is a realization that men and women need each other, and that only in the closeness of a marriage between a man and woman is a completed human being formed. In this age, however, such connections are being severed, such relationships fragmented. There is only the individual and, perhaps, the state, with no connection with other individuals except fleetingly, through a kind of sexual pleasure that has no relationship to real consummation or the creation of life. If it does appeal to those who have been so carefully taught to disregard those older virtues, it may be as a kind of refuge, an escape from chaos to order. This post and comment thread certainly paints a bleak picture, but I don't see things so 'black and white'. While I agree that there are concerns to be had, it's worth noting that this stuff has ALWAYS been a niche market, and that niche will continue, albeit smaller than before. My grandparents would all be in their eighties (or close to it) if they were alive today, and yet none of them had any interest at all in anything vintage, and certainly no interest in passing any appreciation of such material to their children or grandchildren. Old movies, radio, comics etc. were things of the past and deserved to stay there. And yet, here we are in the 21st Century. TCM soldiers on with no apparent signs of stopping, largely appealing to a demographic who want to watch old movies but have no interest in collecting them. Podcasting has given younger folks two smash hits of the format that focus almost entirely on classic cinema (You Must Remember This and Gilbert Gottfried's Amazing Colossal Podcast) surely introducing those who listen to audio via their phones to movies and people that they'd otherwise have not heard of (listenership is in the hundreds of thousands for each). Theater chains trot out the old warhorses on the regular in sparkling digital transfers to play nationwide engagements that surely wouldn't continue if the attendance (ie: money) wasn't there. Indeed, even new transfers of Laurel and Hardy material is touring the country. We are a very different society than we were when these films were made, and it is true that an increasing amount of them will be considered "problematic", but good storytelling is good storytelling. There will always be people who appreciate that.